The hype that we heard before Christmas about Apple’s new ‘tablet’ being the game-changer – and saviour of publishers – has now died away. Nonetheless, despite being criticized for sounding like a sanitary towel, the iPad is selling fast (over one million units sold since its launch only a month ago) and its advent has forced Amazon to grant publishers some say in the pricing of their e-books. (The scuffling between Amazon and different publishers is one reason why certain books have their ‘buy’ button disabled on Amazon, causing huge frustration among readers looking to get their hands on, say, the latest cult e-fiction from Penguin.) 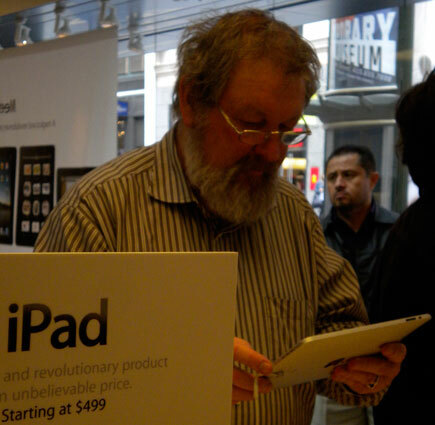 In addition, the iPad’s success seems to have scuttled plans by Microsoft and Hewlett-Packard to launch their own rival tablet computers. Given all the hoopla, it was interesting last Monday when passing through San Francisco to drop in on Apple’s main store and take a look. No, let’s be honest, I intended to buy an iPad – but that wasn’t to be. Stocks had run out the previous week but a truckload of new iPads were delivered that Monday morning. Quickly, the word went out, a huge queue appeared and soon snaked around the block, but by 1 p.m., two hours before we got to the store, stocks were again exhausted. Ultimately, the weight needn’t be a problem (after all, the iPad isn’t much heavier than a chunky hardback book). But the dimensions of the iPad – slightly smaller than an A4- or US Letter-sized piece of paper – means it’s not something you are going to just slip into your pocket and carry round with you all the time. That said, the size of the iPad and its stunning colour display makes it the first e-reader with the potential to transform how we present scholarly research into something utterly new. This isn’t something that is a static, monochrome and two-dimensional imitation of the book (like the Kindle) but a dynamic, interactive, vibrant, loud and boisterous ‘unbook’, an entirely new beast in our backyard. For instance, I could imagine using the iPad to view Robert Cribb’s Digital Atlas of Indonesian History (shipping to our warehouses right now). It would be more than stunning; it would be awesome. But the key word in the above is ‘potential’. For the moment, it is not possible to connect an iPad to a printer, let alone download files (there’s not even a USB port). Viewing the Digital Atlas might be awesome but using its maps (not least downloading them) would be nigh on impossible – in other words a sad, crippled experience. It is not for nothing, then, that the ‘noise’ about the iPad is confused (you could even say the discussion sounds like the static once heard on old radio sets). Yes, the iPad is groundbreaking and yes it has its limitations but YES it opens the possibility of doing many things previously not possible in academic publishing. Sounds like we are in for an interesting time. You are currently browsing the GETTING PUBLISHED blog archives for May, 2010.